5G technology is the next version of communication systems with a higher level of performance and ubiquitous connectivity. However, it comes with its own challenges. Since the 5G technology will operate at high frequencies, one of the major concerns would be the thermal energy radiated from devices like connectors. The heat generated from the connectors can damage their structure as well as reduce the lifespan and performance. To avoid this, proper materials must be chosen for shielding that can withstand the heat and restrict thermal energy from radiating. Analysis on a connector is carried out using Altair tools FEKO and Acusolve. 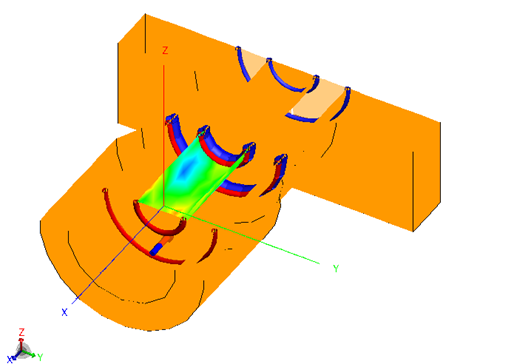 The electromagnetic simulation tool FEKO is used to calculate the current (A) and power (W/m2) values. The Method of Moments (MoM) solver is used for simulations at a frequency of 40 GHz. Results are obtained using different delectric materilas as coatings for the connector. The current and power values obtained from FEKO combined with Joule heating concept are then used to obtain the thermal radiation from the surface of the connector using Acusolve. 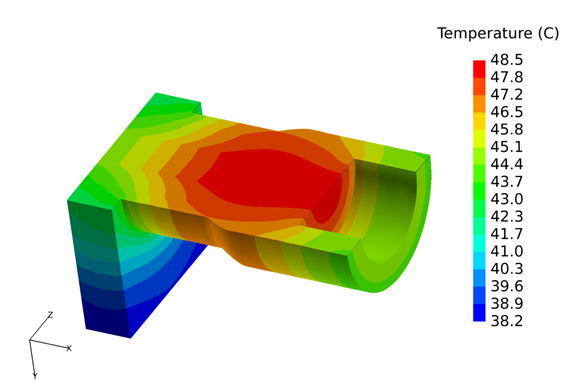 This analysis helps in thermal mapping at the surface of a connector. Also, the shielding performance of different dielectric materials can be tested to find an optimum shielding for the connector.